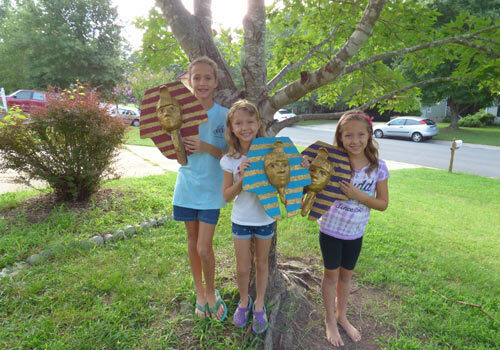 Studying Ancient Egypt and looking for a great integrated art program that includes great art projects for Ancient Egypt? Maybe your family has touched on some topics about Egypt, and you would like to round out your child’s knowledge. Or perhaps your co-op needs a great art unit for next semester, or your family is looking for art projects to do together over a school break. Whatever the reason, welcome to Ancient Egypt! In each of our units you can expect great history told in story with great art history images and hands-on projects. We put the visuals on history. That means when we study about Ancient Egypt, we show images of characters from Egypt painted and sculpted particularly for their tombs. We also talk about their belief in the afterlife and contrast it with Christianity. At Take Time for Art, we put art in the context of history and teach from a Christian worldview. But we do more than just look at great art. At Take Time for Art we make real art based on real art. That means that in Ancient Egyptian Art when we look at the beautiful Egyptian mummy masks, visit the mask of King Tut, and talk about how the masks were made, we then make our own version of an Egyptian mummy mask. In addition, we offer simple and more complicated versions so that most of your family can participate together and at their level. What art projects are included Ancient Egyptian Art? Take a look at our product page for more information about Ancient Egyptian Art. We have a preview video and information about pricing. Want free shipping? Just purchase three art materials packs or more and automatically get free shipping at our checkout! We truly want to help you bring hands-on art to your family and make it relevant, fun, and fascinating. Plus we teach from a Christian world view. It’s a good day to Take Time for Art.